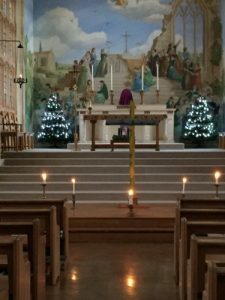 Earlier this week, a Lampedusa cross arrived at St Mary’s and was displayed in the Chapel, to help the girls reflect on the refugee crisis. Boarders held an evening vigil to pray for those who have died on their journey to safety. Francesco Tuccio, a carpenter from a small Italian island of Lampedusa, was so moved by the hundreds of refugees fleeing Eritrea and Somalia who drowned off the coast, that he gathered driftwood from the wrecked boats and turned them into crosses, which he offered to survivors as a symbol of hope. Pope Francis carried one of the Lampedusa crosses at a memorial Mass to commemorate those who have died and the British Museum is now displaying a Lampedusa cross as a reminder to people of the refugee crisis the world is facing today. Inspired by Francesco Tuccio’s actions, CAFOD has sent Lampedusa crosses to schools and parishes across the UK.